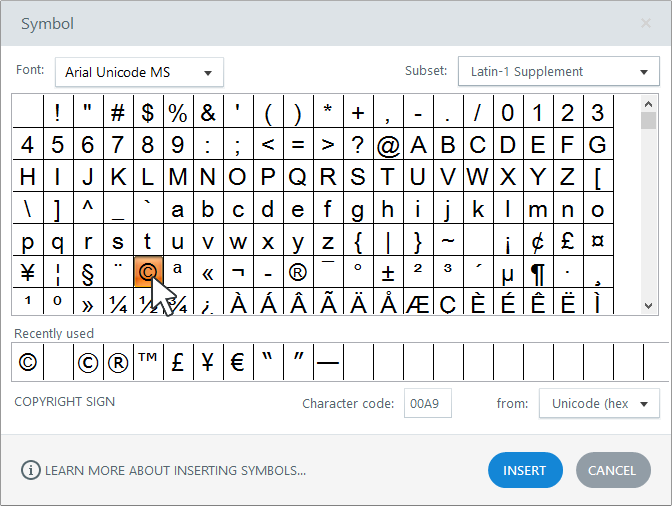 Use Quizmaker 360's symbol library to add characters to your course that aren't normally found on a keyboard, such as copyright symbols, trademark symbols, paragraph marks, accented characters, and Unicode characters. Symbols can be added to any object that supports text, including text boxes, captions, and shapes. Add a new object to hold the symbol or select an existing object. If there's already text in the object, place your cursor where you want to insert the symbol. Go to the Insert tab on the ribbon and click Symbol. Enter the symbol's code directly into the Character code field at the bottom of the window if you already know it.